Carl F. Bucherer’s Patravi ScubaTec diving watch is attractive, robust and easy to read, both above and below surface taking from the characteristic of the Patravi collection. The Patravi ScubaTec diver’s watch offers a multi adjustable clasp and an automatic helium release valve to ensure ultimate comfort and worry free equalization of pressure. Created with the highest grade of stainless steel, its rugged ceramic bezel and blue illuminated hands and dial markers ensure perfect readability, even at the deepest depths. 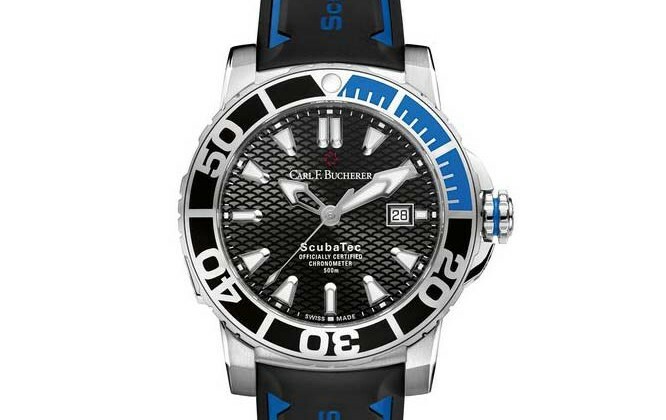 Carl F Bucherer Patravi Scubatec Divers Watch : Divers Watches 0 out of 5 based on 0 ratings. 0 user reviews.